My mom keeps me in business all by herself, from requesting items to buying fabric that she really likes but gives to me to use. To be honest, sometimes making things for my family is more stressful because I just know they'll say they like it even if they aren't completely satisfied with it. They are just that nice. 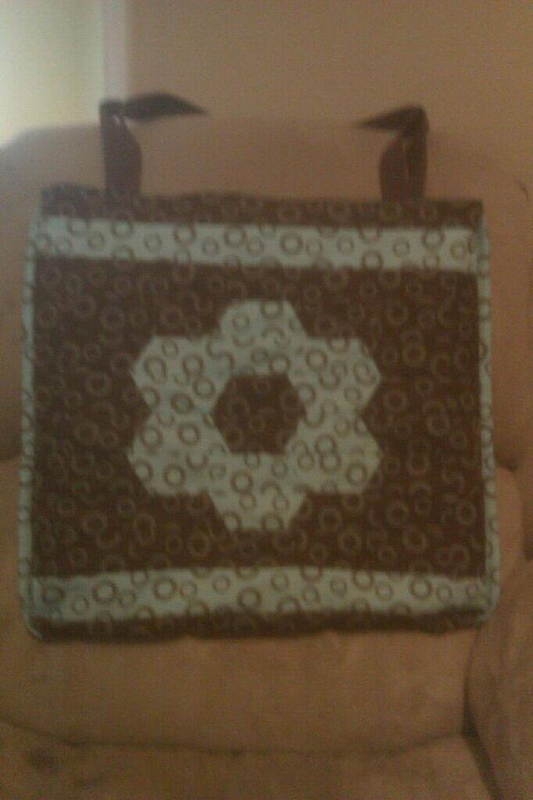 This past November, I was commissioned to make a bag for my cousin, with no specifications other than general size. 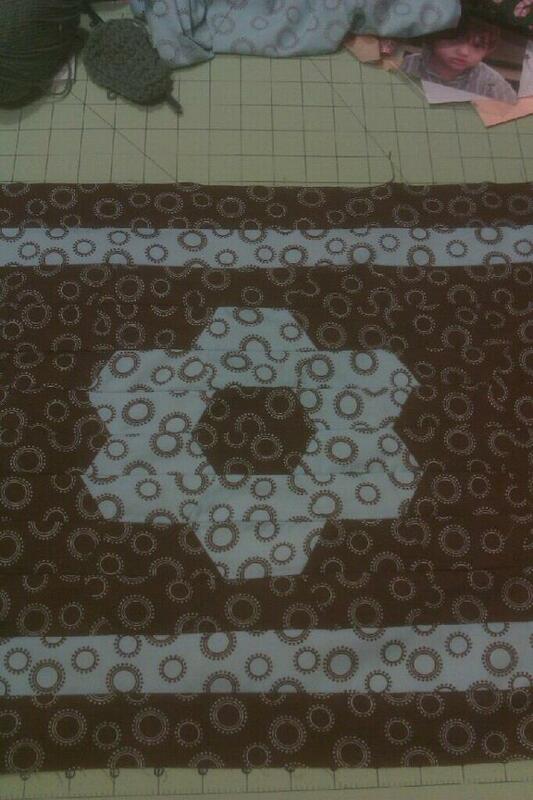 I decided I wanted to try a hexagon flower, pieced together, not applique. My google search quickly taught me that there was more to this flower than just sewing it together. Paper piecing sounded too frustrating and time consuming at the time. I just wanted to be able to put it all together, ideally without trying to conquer too many new techniques. 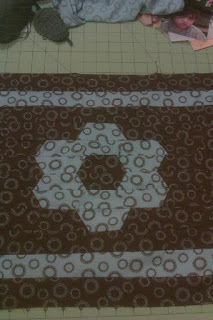 Fortunately, I found a blog called Sew Many Ways that had a simpler version of how to sew hexagons. And, it was designed to be machine sewed, which was a big bonus for me. Between her easy to follow instructions and clear pictures, I could picture what I needed to do just by reading through the post. Find the tutorial here. The blue stripes were not in the original design and were added when I realized the bag was shorter than I planned. I didn't take into account that cutting the hexagons in half and then sewing them back together would make them smaller. Duh, but I was being hasty. But, that "fix" ended up adding to the design, in my opinion. Anyway, I'm sure you experienced sewers, and probably even beginners, can see some irregularities and mismatching. I had some rows come out not so straight and instead of ripping out seams and redoing, I just kept going, hoping I could hide it. The next issue I had was the blue stripes did not line up when I put the two sides of the bag together. Hmmm, wonder where that problem stemmed from... maybe I should have taken out the uneven rows and fixed them. So, I decided to add a blue mock binding to the edges to distract from the unevenness. Pretty effect...except at the corners where it folded in funny. Grrr. So, at this point, I'm feeling horrible but am still too stubborn to start over or scrap it. Through much texting with my mom about these issues and if she thought it would be okay or if I should just say forget it; I went ahead and finished it, errors and all. Sorry for the bad photo quality, I took it with my phone with no intention of ever needing it besides sending to my mom. So, my cousin said she loved it and my mom said it came out very nice. I'm still undecided because I feel like I just kept trying to hide a mistake that kept growing. Kind of like lying. Honestly, I think at a glance it looks nice, but I can't just glance, my eyes automatically look for bad spots-which, to me, are everywhere. Nip mistakes in the bud-there are very few that can be hidden along the way. More than likely, that little oops is going to come back as a bigger issue. TAKE YOUR TIME-Proper piecing is really crucial and mismatched seams can be very distracting when it comes to the finished product. Have a plan, but be prepared to wing it-my spur of the moment additions actually ended up adding to the design-I just wish I had been more of a perfectionist from the beginning. Now, I promise I am not a sloppy sewer, I only sell items that I am happy with in my Etsy shop. I just wanted to share my experience in an attempt to help other avoid this issues. It's nice to have family and friends to try new things with. This way, if I decide to make something similar to sell, I'll be more aware of the challenges ahead and where I need to pay closer attention. I recently purchased tiny 2" hexagons from another Etsy seller, Spring Water Designs, and already have a plan for them. 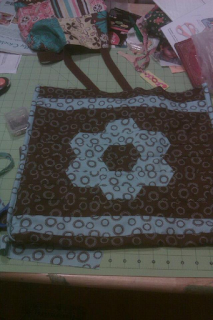 Since they are so small, I will not be doing the cut-in-half technique I used for the bag. I'd like to try the paper piecing, but may end up just appliqueing. Either way, I'll let you know! And with better pictures (hopefully)!